Why am I considering the Conditionalist view of hell? The traditional view of hell, that of eternal conscious torment of the lost, is under fire again, this time, not from Christian Universalists like Rob Bell, but Conditionalists, who believe that the Bible teaches that the unsaved are punished at judgment, then are destroyed, NOT tormented forever. The term ‘Conditionalist’ is short for “Conditional Immortality,” which means that we are not eternal souls, but temporal souls who must inherit eternal life in order to exist for eternity. I am strongly leaning this way, but of course, am not quick to abandon the Traditional view, which has been the orthodox position for most of Christian history. I am often asked WHY I am even questioning this doctrine. So here you go. The greatest reason to consider the view is that it may be a more accurate interpretation of the text, we want to ‘rightly divide the word of truth’ (2 Tim. 2:15). While every interpretation may have some open questions, the Conditionalist view obeys Occam’s razor, that is, it is a simpler, less convoluted answer, it’s a more straight forward reading of the text. So when, for example, Jesus says “And do not fear those who kill the body but cannot kill the soul. 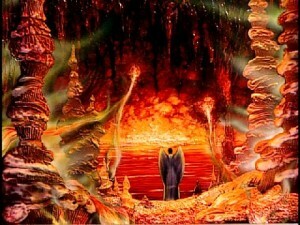 But rather fear Him who is able to destroy both soul and body in hell”(Mt. 10:25-27), we don’t have to explain that “destroy” actually means eternal separation from God, it just means “destroy”! Using this simpler approach is not simplistic, and I’m not saying that simpler approaches are always better, but in this case, I think it solves more theological dilemmas than it creates. A second reason to reconsider it is that we claim that God is just, but the perceived injustice of punishing someone for eternity for sins performed in a short life seems out of balance, that is, it violates the law of proportionality. In the context of punishment, the common phrase for this is that ‘the punishment should fit the crime.’ Does the eternal torment view actually violate this rule of justice? Many thoughtful, caring people see eternal conscious torment as overkill, and so reject the faith. And many, like myself, have temporarily or permanently left the faith because eternal torment seems unjust. I do not claim that this perceived injustice is a good enough reason to doubt eternal torment, since eternal torment has its justifications. I even presented the traditional justification in Why eternal punishment? But once we open the door via exegetical scrutiny, we should also re-ask the question of proportionality. It is important to understand what is and what is not just,, since God commands us to do justice throughout the scriptures. It should not be a complete mystery to us if we are to do it! My experience is one of relief that I do not have to justify the “injustice” of eternal hell anymore, instead, God will “repay each person according to what he has doneâ€ (Mt. 16:27), and then, after this just punishment, the person’s existence is over, and they fail to enter into eternal life. This seems entirely fair. This is still a fearful and terrible end, yet just. Or so it seems. You can read and lsiten more about the growing Conditionalist movement at www.rethinkinghell.com. I have recently found myself leaning this way as well, simply because it does in many ways seem to fit the biblical texts a bit better. I appreciate your linking to the Rethinking Hell podcast. That has been very helpful, particularly the interviews with Preston Sprinkle. Hi too am amazed at how much better the conditionalist view fits the Scriptures. It makes me wonder how many other Orthodox doctrines I have accepted as scriptural that may be questionable. I also abandoned inerrancy for the same reason. Well, I would disagree with you on the inerrancy bit (depending on how it’s defined, of course). I don’t see why it would matter how any view fits with the Scriptures if we can’t trust them anyway. Although I’m not one much given to cherry-picking verses to support or refute a position, this one verse seems to obviate the judgement, then, destruction possibility. David, for a long time that passage was also the one keeping me from this view. However, I found out that it is actually quoting from the Old Testament. In the original context of Isaiah, that was referring to the land of Edom. The verse continues. Rather, what is meant in Isaiah is finality. Edom was completely and finally destroyed. So when the angel and then John quoted this passage in reference to the lake of fire, they would have been referring to the finality of the punishment. Those in the lake of fire would be completely and finally destroyed. Thank you, Chuck: I will have to consider that. It is quite clear that specific verse is citing the Isaiah passage and that Isaiah was prophesying against Edom to a time when God’s patience for how His people were being treated will finally run out. It is also pretty clear that the events Edom experienced (I believe at the hands of the Assyrians) foretold a time when God’s patience would finally run out and the world will accept His judgement at long last. I’m also aware of Daniel’s caution about “the punishment fitting the crime” and eternal punishment seems way out of proportion to the rebellion these lost have evidenced. However, by the same token, our reward, being so “not deserved” as it is, also seems grossly out of proportion to what I deserve and isn’t that an equitable comparison to our perception of what a lost sinner merits for his sin? Don’t get me wrong: I’m not yet prepared to leap to either side of the argument. I’m trying to sort this out as I’m writing and I appreciate your assistance as I move through this. Fortunately, our salvation is not conditional upon how we understand this concept so we’re good continuing to look at it. The problem is that the verse in Isaiah you’re talking about is an earthly parallel to Rev 14. There obviously isn’t an earthly condition where it is possible for fire to literally burn for all of eternity. One of the problems I have with conditionalists is that they take earthly parallels to try to answer spiritual ones. There isn’t a traditionalist that I am aware of that claims an earthly condition can be a perfect example of something eternal. Also, it assumes that the NT writer John, must use Isaiah’s quote exactly in the same way as Isaiah did, I don’t see any real justification for forcing that upon John. As for eternal hell being “disproportionate” says who? Who are we to judge what is proportionate and what isn’t? If we go down this line of reasoning, then we are really setting ourselves up as the ultimate authority of what is ethical and not God. Annihliationism also seems not entirely compatible with Jesusâ€™s prophesy of Judgement Day, where the Lord condemns people to â€œeternal fire prepared for the devil and his demonsâ€ and â€œeternal punishmentâ€ (Matthew 25:41,46). Hell was among the first tenets of Christianity I rejected, because, like Iâ€™ve written before, I would not want to go to heaven, if there were a hell too. If you listen to the last podcast (#7) at rethinkinghell.com, you’ll hear the explanation – the word ‘punishment’ is elsewhere called ‘destruction’, and in both cases, the descriptor is eternal. In light of the rest of scripture, this word ‘eternal’ is describing the final state, not the process. So, eternal destruction means a permanent destruction, not an ongoing one. Same with the word punishment above. The punishment, which is destruction, is permanent. You might respond that eternal life means ongoing life, but there’s an answer for that as well – even if you say that eternal means the state, and not the process, as it turns out, eternal life is ongoing either way you look at the word eternal. BTW, it seems that Annihilationism would address most of your complaints about eternal conscious torment. Does that mean that you gave up Christianity under the false pretenses of eternal hell? I think many have, and you state that this is one of the chief reasons you began to leave. I also left for that reason and a few others, but returned because of the things I *did* believe. I am relieved to find that Conditionalism seems much more scriptural, and fair. You suggested that there is a “perceived injustice” about “punishing someone for eternity for sins performed in a short life,” that it “violates the law of proportionality.” I would like to sift your thinking a little if you will permit me. You indicate a “law of proportionality,” an idea that “the punishment should fit the crime” (lex talionis). Whose law is this? If that of sinful man, then what does it matter to a most holy God? But if it be God’s law, then on what basis do you conclude that the sentence is out of proportion to the offense? Is your basis the lifespan of the sinner (“sins performed in a short life”)? If so, then are you prepared to defend the notion that whether a sentence is just or not is determined by the duration of the offense? Lex Talionis is biblical, and is covered in three separate OT texts. It was given primarily to LIMIT revenge and to instruct judges in fair recompense. However, sinful people turned it from a LIMIT to a REQUIREMENT and justification for retaliation in kind. So Jesus’ NT rebuke of it is not to say that it is unjust, but rather, that in personal matters, we ought to forgive, even THOUGH equal retribution IS just – we can’t use it as a justification for our desire to retaliate or hate. It is merely a principle of juris prudence. So I would say it IS part of ‘God’s Law.’ See Jesus and the Law of Retaliation (Lex Talionis) Matthew 5:38-42 for more. Regarding temporal sins and eternal punishment, the principle is simple – it’s out of proportion. But if you want to get technical, we must ask, how do we measure the full wickedness of a sin. So, what I am saying is that, since the Duration of Hell is infinite, the measure of the impact of it’s Justness is INFINITE. So if we believe that Lex Talionis instructs us that the punishment must fit the crime, Eternal Hell is unjust. Again, unless you argue that any sin is eternally severe to God. You could argue that. OR, as C.S. Lewis argued, since sinners continue to curse God, the duration of their sin is eternal. I believe the standard traditionalist response would be that every sin we commit is committed against an infinite God; therefore, every sin we commit is inherently of infinite severity. However, at this point we are simply playing guessing games with how God’s justice works. That is why I don’t think we should ever use God’s justice (or any other attribute of his) as an argument for what he would or would not do. Rather, we should simply see what the Bible actually says that he has or will do. We may then conclude that God’s actions, whatever they may be, are indeed just and loving. If necessary, we then adjust our definitions of “justice” and “love” accordingly. I wrote a bit more about this concept in a post on my blog, if you don’t mind my linking it? I still think we must make this as a secondary argument. Sure, we first argue from scripture, but the ethical/philosophic argument regarding proportional punishment is a valid objection which we must address. I understand your argument that perhaps we should not argue from God’s attributes, but I disagree. I think that this is a perfectly valid way to argue, with limits. Just because their are paradoxes does not mean we throw up our hands. While our understanding of justice is limited, God expects us to act justly, and that required us to understand the principles of justice. And those principles of what is just also apply to God, with some clarifications. To avoid this, I think, is to duck a reasonable issue. I do agree, however, that God does expect us to act justly, based on justice as he has revealed it through his actions and commands. By the way, I would also agree that traditionalism does seem to be unjust, based on my understanding of justice. I just don’t think that is the best way to argue it. Hmm, you do bring up an interesting point related to speaking with atheists. The context for my reasoning is a discussion among fellow believers over what the Bible states. In that context, I don’t think we should appeal to God’s attributes. However, the context of talking with atheists would merit a different approach. There is another reason to not argue from God’s attributes, and that is, God does not ‘have’ attributes, he embodies them. So God does not have love, He IS love. Or in the solution to the false Euthyphro Dilemma, goodness does not exist independent of God, God IS goodness, so when he declares what is good, it is not so because he declares it (it is preexistent), but it is dependent on Him because it’s reality is rooted in God. Confusing, but it does solve that ‘dilemma’ to say that God does not have those attributes, he is those things.